I’m no stranger to Mexico. My husband Thom and I have visited the country dozens of times throughout the years. But one thing we’ve never done is driven the Baja Peninsula. Every now and then I’d find an article or book describing the many interesting sights and towns we could find the further south we traveled. 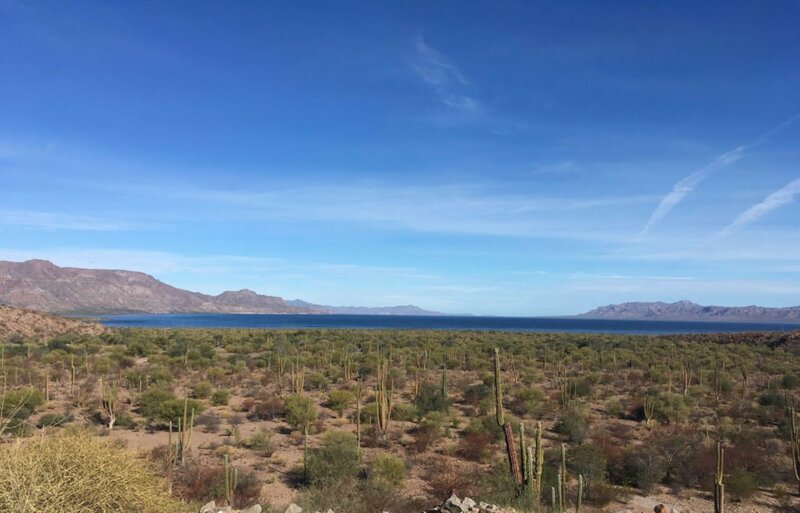 So, after several decades of hints, Thom happened to read something earlier this year about the Sea of Cortez and specifically about a town named Loreto. With that motivation, I finally convinced him that now was the time. Of course, as with all travel, the journey got more complicated the closer it came to our departure date. And now that we’ve gone and returned, I’m reminded that all travel, like life itself, is a series of adventures, trust, and even a few potholes. In case you are wondering, Loreto, is a small Mexican town nearly 750 miles south of the California border. 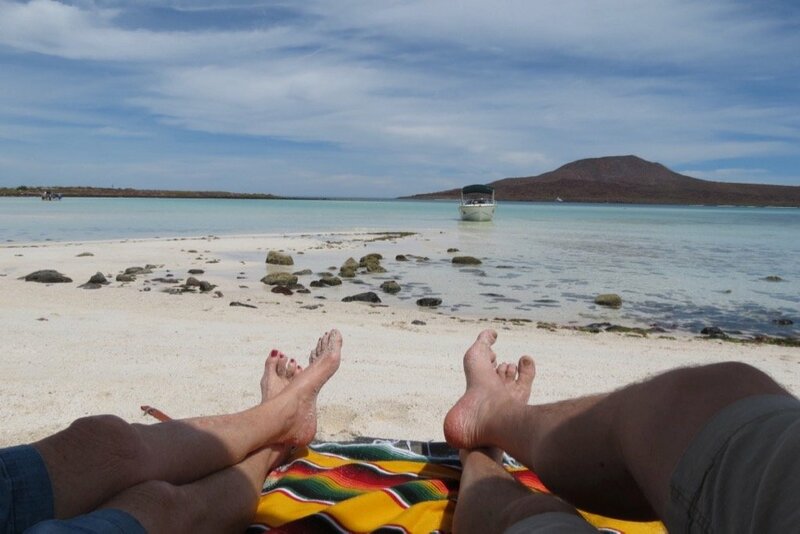 The internet is filled with photos and articles about this pleasant little town on the Sea of Cortez. Thom’s main interest was spending time on the Sea with its abundant sea life. Me? I am always eager to travel to locations I’ve never experienced before. 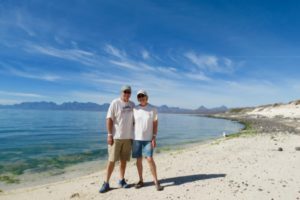 As I was researching places to stay and things to do, I discovered our timing was perfect to visit a special area about halfway down Baja. A large lagoon on the Pacific side of the peninsula is one of the few breeding and birthing areas for large Gray Whales who migrate each year from Alaska. March is considered the best time to get up close to see (and even pet!) these magnificent creatures. I was ready! What to do with Kloe? Within a week I had joined an online pet-sitting community, posted information about our home and our needs for Kloe, and had several people contact me for potential sits. Out of the five or six that applied, a retired couple from Oregon seemed to hold the most potential. They were familiar with our community, could drive here from their home, loved to walk (a big requirement for Kloe), and wanted to be here during the time we would be gone. After several emails, we SKYPED with them for about 30 minutes and they committed to staying in our home and watching Kloe during the travel. We were set! 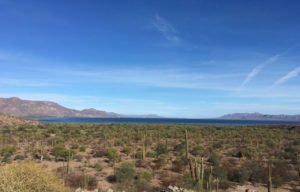 Driving along the Sea of Cortez near Mulege. This new pet-sitting arrangement seemed perfect. Kloe could stay in her own home with nearly constant companionship, she would be walked daily and fed her normal diet. Meanwhile, our home was secure with people staying here, and importantly, we were saving a small fortune by not having to pay up to $50/day during our nearly two-week trip. Our sitters stayed for free in our home and got to enjoy our community in a place they wanted to visit. It is a win-win for both sides. The funny thing is, when we explained to other friends that we had found these wonderful people to stay with Kloe in our absence, many were shocked. How could we possibly allow strangers to stay in our home and watch Kloe for nearly two weeks? 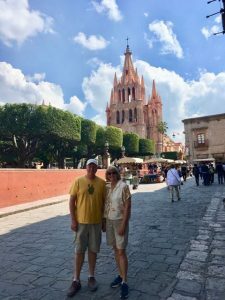 Now, we are very accustomed to people acting horrified when we tell them we are spending time in Mexico—but this time nearly as many people expressed misgivings about leaving our house and dog in the hands of people we didn’t know. Enjoying our last night in Loreto with new friends. 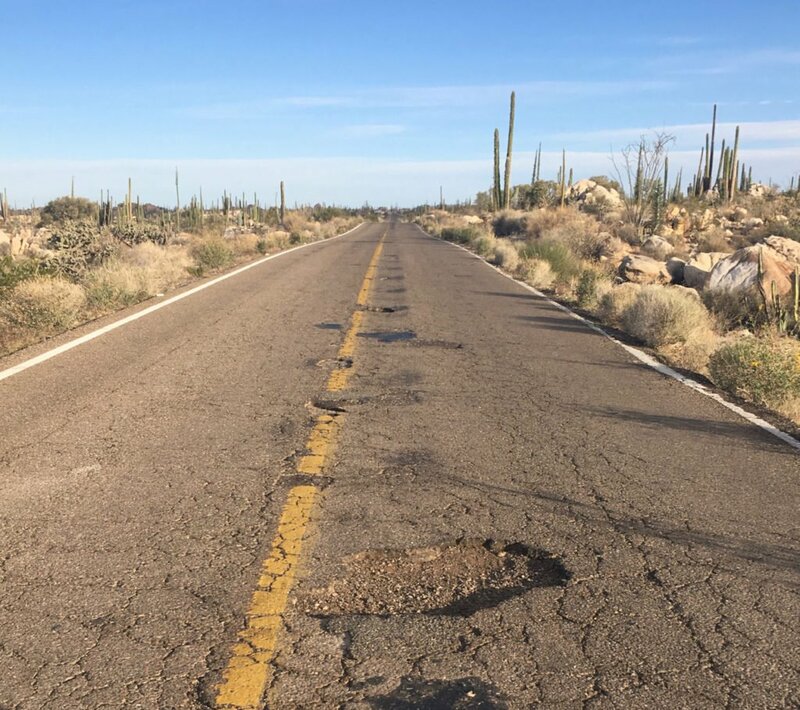 A glimpse of some of the bad potholes along the way. One more issue remained for our trip to be a success. When telling a neighbor about our plans to drive down Baja, he insisted on showing Thom a YouTube video about the road conditions. 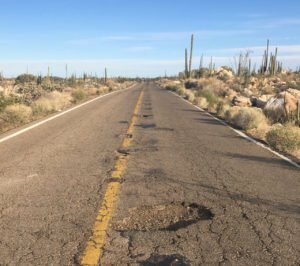 The video he offered showed a road badly pockmarked with huge potholes during a torrential rain shower. Our kind neighbor warned Thom that we should carry two spare tires with us on the trip just in case we bottomed out on some of the potholes. 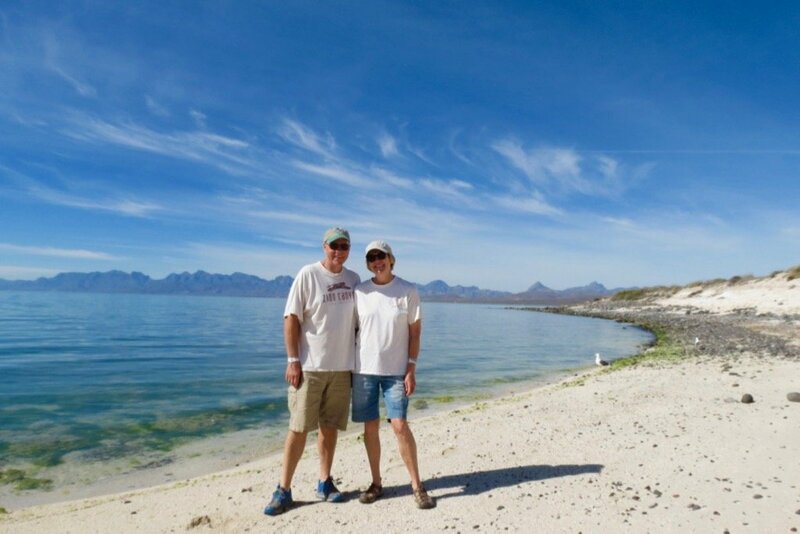 On the beach of Coronado Island off of Loreto Bay. Again, isn’t life like that? We can either stay home and try to protect ourselves and be safe, or we can head out on adventures. We can worry about things that never happen or we can make the best of (and enjoy) things as they come. We can be flexible and try new things and experiences, or like hamsters on a wheel, we can just keep going around and around. We can trust that the Universe is friendly, that people are basically good, and that things generally work out well for us. Like nearly everything that happens, it is SMART to remember that the daily choice is ours to make. Okay, your turn. Have you ever faced a fear that turned out to be little or nothing? How trusting are you? How do you feel about traveling to unusual places? How about pet sitting? I welcome your comments and input in the section below. 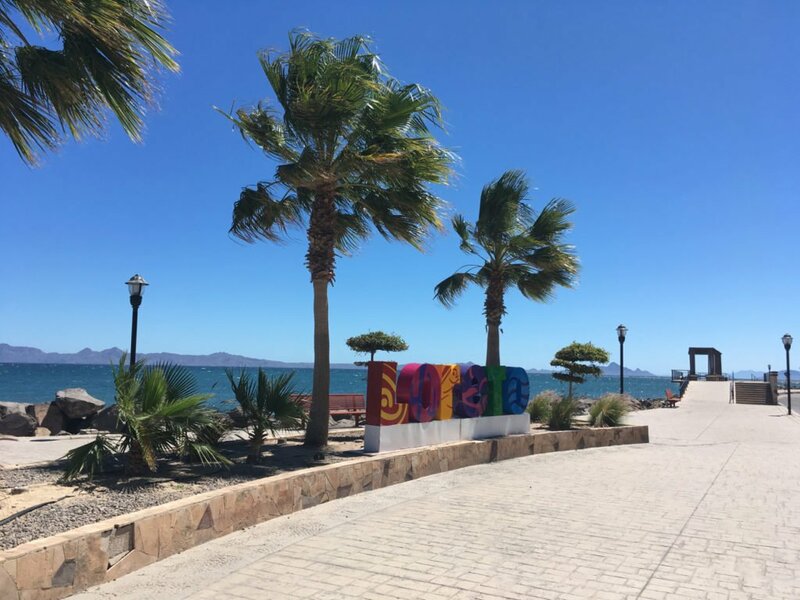 What a beautiful town this Loreto – will visit it for sure one day! Thanks for sharing your journey, Kathy! You’re completely right by saying that there is no need to worry about things that may never happen. Life is too short and we have to live every day richly. Wish you more interesting trips. I’m late reading this, but it seems it’s on a theme with your next post about Amanda Palmer. She, too, was exploring a life filled with trust and positive outlook. Good post, Kathy. Welcome back. In my life, I have tended to say yes to challenges and new adventures. My life has been more interesting and fun because of this inclination, I think. Sometimes things do go wrong. But I believe that a “can do” attitude and a lifetime of experiences problem-solving my way through new situations has helped me be more resilient and capable when bad situations do arise. Sounds like a great adventure, and, whales! Yes!! I’ve always kicked myself more about the opportunities and experiences I’ve passed on, than the ones I tried. Yes, sometimes they didn’t work out; a few were even a disaster. But disasters happen to people in the course of life anyway, even if you stay home and wrap yourself in bubble wrap. I do like to be as prepared as possible for new places & experiences, but recognize that the unexpected will always happen, and sometimes it’s glorious. Perhaps the biggest fear I ever experienced was writing and publishing a book. Not because of doing the work, but the possibility that people might judge me poorly because of it. Guess what, most people liked it and I derived a great sense of satisfaction when I learned that it helped many retired couples find joy in their relationship. Sounds like a great adventure Kathy. 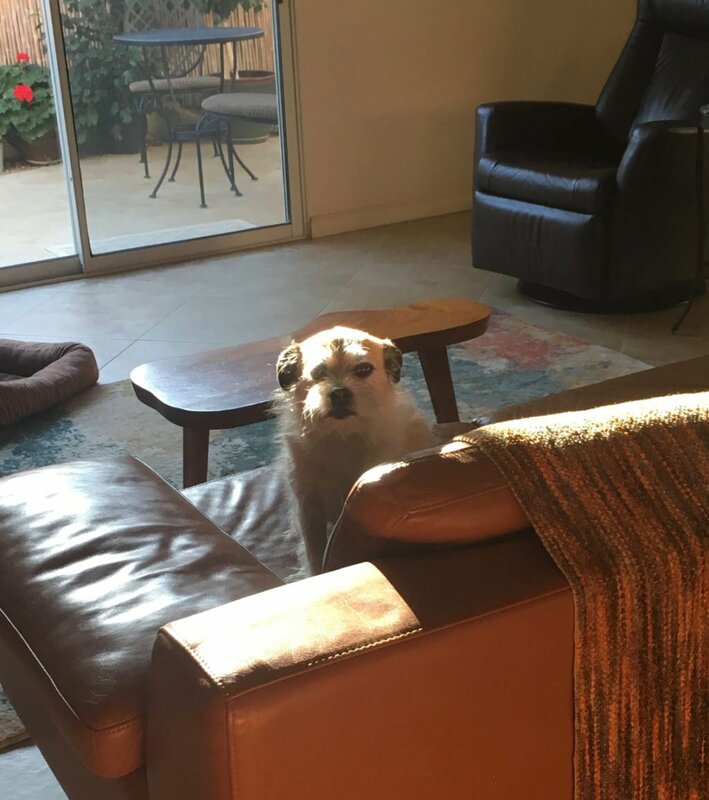 We have never used the services of a pet sitter but have done many home exchanges and I do remember being apprehensive prior to our first home swap, which was many years ago now. As we loved the whole idea of home exchanging we created our website some years back as our retirement project to keep us busy in our retirement and so far so good. Home Exchange 50plus now has 950 plus homes in 50 plus countries and many of our members require pet care and are happy to look after pets when house swapping. Many of our members are new to home exchanging and are naturally apprehensive about letting strangers stay in their home whilst they are not there. Home exchanging is built around trust and we always recommend that, prior to agreeing a swap, that communication between both parties is essential to get to know each other and provide info about home and location. Thanks for the welcome. We do have a small annual membership fee which is displayed on our Welcome page so no need to fill out a form to see our costs, but the point you make does suggest that we need to rethink how we display our fees. Arranging a home exchange does normally take longer than for a more traditional vacation, some of our members are now working on 2019 swaps! Saw this one in my inbox, but not the previous one (since the bell wasn’t selected). This post is such a good example about stepping out of your comfort zone, and of trust and new experiences. Sometimes, it is best to “expect the worst”, like in the pot hole situation, to only discover that it wasn’t too bad. It looks and sounds like you had the most wonderful time in Baja – especially the whale watching was incredible, I”m sure! I hope you will write another post (with more photos) about your two-week vacation! I take it (or hope) that the house and pet sit experience worked out and was a good one? Thanks for the mention, Kathy! Sounds interesting, Kathy. I like that title as well. Let me know what you have in mind, once you come up with “the book”, and I’ll have a look through my blogs for a suitable post/contribution. I will need some time, though, since I’m crazily swamped with stuff right now. We loved our family trip to Loreto! I’m so glad you had a good time, and that the dog-sitting arrangement worked out. Years ago a friend in Zurich told me that she house-swapped with people in various countries. She always trusted that they would treat her home as well as she treated theirs and she was never disappointed. HI Kathy, glad you are back from your travels! I admit to not being a good reader of many blogs these past weeks, but spring break allowed me a little time! Loreto isn’t terribly far from La Paz; our windsurf town, La Ventana, is just 45 minutes south of there. 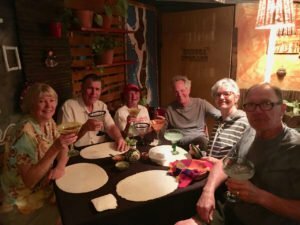 Hans could tell you stories about his journeys from Sacramento to La Paz, easily a 3-days drive. Don’t drive at night due to those potholes, random cattle and federales! Talk about trust!! 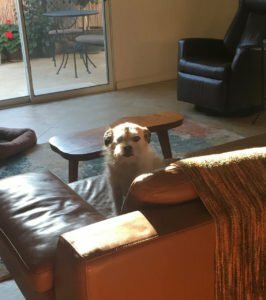 You mentioned Liesbet…she tells me there is also a free sitting exchange for those just looking for housesits, like we would eventually need. Glad your trip was memorable and relaxing! Welcome back, Kathy and Thom! I love the quotes from Einstein and Twain. I think there is a big difference between SMART trusting and blind or naive trust. You, of course, did it the SMART way. 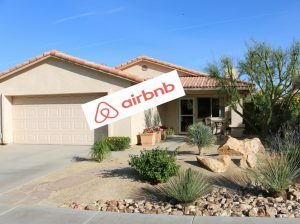 I’d love to read more about your trip, the house sitting experience, and your new friends… it looks fantastic! Looks lovely! When we had our beloved dogs we did have to work our vacations around our dog sitter. When she moved we had a couple of others that were OK but really didn’t give us peace of mind because we were spoiled by our former sitter, worked for our vet, for 10 years! Traveling to different areas is fun but I think I would have packed the extra tires and extra gas. Hi Haralee! 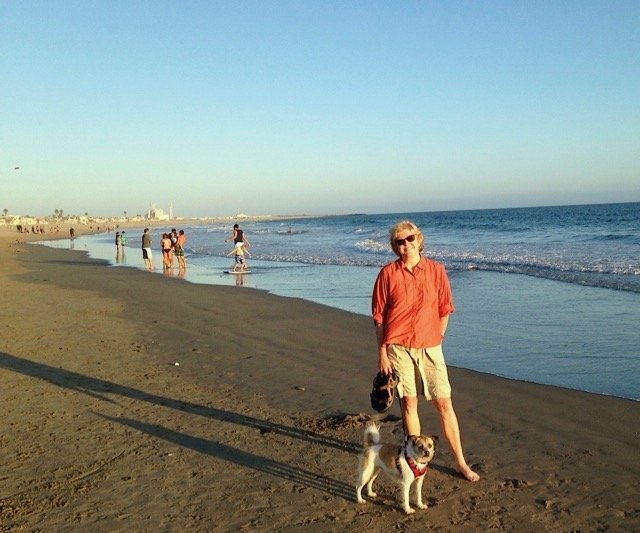 Hasn’t the internet has become such a wonderful resource for those of us who love to travel–and the pet/house sitting hookups are just one piece of the puzzle. Between home exchanging, Airbnb, uber, and now this…there are so many wonderful ways to travel in less expensive ways. I can’t wait to see why people come up with next!! I might have felt cautious about house and pet sitters before, but since reading Liesbet’s posts, I haven’t had a moment’s hesitation. (Other than the fact that one of my dogs would immediately run away from anyone who isn’t me. Hopefully that will change soon.) Besides, you did your due diligence – emails and a Skype conversation. Some people do seem to worry rather needlessly. I wouldn’t have enjoyed the 50 miles of sketchy road, but it wouldn’t have stopped me from seeing the whales or the Sea of Cortez. I’m with you… and Mark Twain. Hi Karen! I know…until I was fortunate to meet Liesbet and her husband I had never really considered it myself. But once we had both Thom and I were sure that if we found sitters that were half as sweet and conscientious we would be pleased. Of course, I would have LOVED to have them sit for us but their schedule is pretty packed. Now we just have the opportunity to meet other great people who like to do the same thing. Welcome Home, Kathy and Thom! I am glad to hear that you had a wonderful trip and that Khloe had great people to take care of her (I would love to read more about that). I agree with you and Einstein – deciding if the world is a safe place or a hostile place significantly colours our perceptions and actions. I am glad that you took the risk, enjoyed the adventure and have continued to discover what an amazing place our beautiful world is (and can be)! An adventurous life does require a great deal of trust. We are having our daughter’s wedding in Cancun in December, despite the warnings of tainted alcohol, drug thugs running rampant and reports of many shootings. We have regular shootings in a neighborhood not far from our upscale home. Danger is everywhere, and you can’t let that stop you from living. Thanks for the link to house sitters! The more I read about this (and positive experiences), the more I’m considering it. I want to do a cross-country Rt 66 trip …maybe next fall…and have wondered how to accomplish it with our dog. I think through lots of scenarios when traveling…tend to over pack because of the “what if’s”. I think I’d have put 2 tires in the car, plus spare gas, spare water, tent & sleeping bags, fully stocked emergency kit with bandages….hah. Wonder what my Cross-country vehicle should be with all that extra stuff!